​Congratulations to board member, Angie and her husband, Ron who adopted Whiskey Gentry. 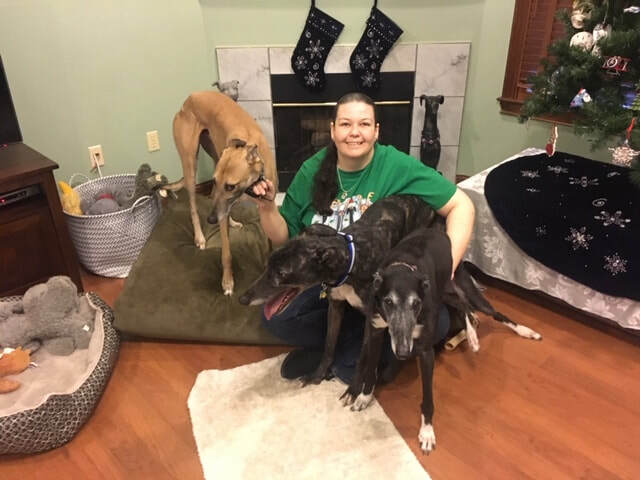 Angie said he reminded her of their first greyhound, Ebb T. They lost their big brindle boy, Speedy a couple weeks ago to what they think a heart attack. Whiskey met Maggie and she gave her OK to bring him home. He will be Angie's Meet & Greet dog at the Mason Petsmart. Be sure and stop by and say Hi to this handsome boy. Bodie and Bolt where happy to have another family member too.